My wife Maggie and I recently spent a few days in Venice. Extraordinary place. It’s has been going round in my head ever since, even in my dreams, like some kind of mystery my brain is trying to solve. But leaving all the rest of it to the side, here is just one thing we saw there which in itself keeps going round in my head. 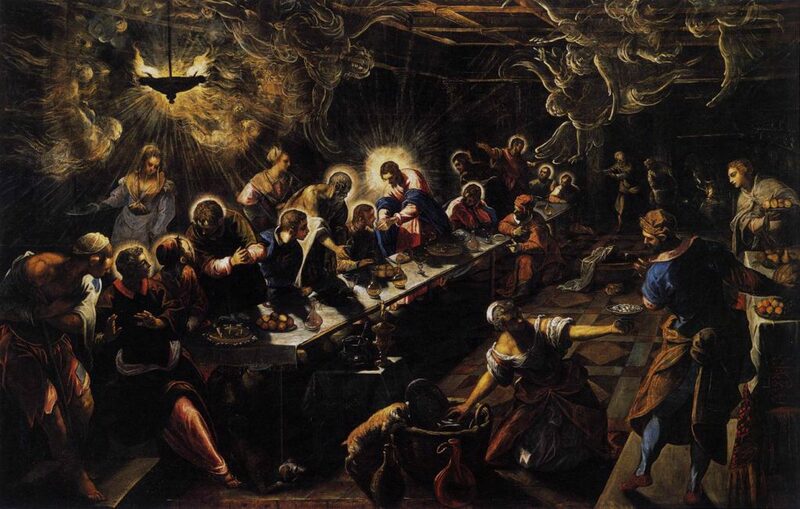 It’s in the church of San Giorgio Maggiore, on the island of the same name (which you can see across the water if you stand outside the front of the Doge’s Palace) and is a painting by the Venetian Renaissance painter, Tintoretto: The Last Supper. The original is getting on for six metres wide, so you need to make this picture as big as as your screen can make it if you are to get any sense of it. The thing that struck me at once, not even knowing yet who the artist was (I am no art buff), was the drama and almost eerie immediacy achieved by the arrangement of the figures and by the sharp contrasts between light and shadow. I suppose by far the most well-known picture of the Last Supper is the famous mural by Da Vinci, which is at least as dramatic as this one in terms of what is going on between the characters, but nevertheless seems to me (on the basis of reproductions) to be much further removed from the viewer, much cooler and more static. What I get from this painting was a powerful sense of what a mysterious, explosive, dynamic thing a moment actually is. Everyone in this picture is present at the same point in time, but no two of them have the same sense of what is going on. A couple of disciples towards the left of the picture, for instance, seem to be involved in a conversation of their own that may not even be connected with the famous event unfolding in the middle of the table (an event to be re-enacted over and over again for the next two millenia, including on the altar immediately below where this picture is hung!) The disciple immediately to Jesus’ left seems withdrawn into his own throughts as he watches, perhaps to avoid having to engage with Judas sitting opposite him. Judas, as jealous people passive-aggressively do when trying to undermine someone else’s big occasion, seems to be trying to draw into conversation the disciple being given bread by Jesus. The waiters are getting on with their various jobs: at the near end of the table one of them is asking one of the disciples whether he wants anything else and the disciple is very clearly indicating with both hands: ‘Not now. Something important is happening.’ The semi-transparent angels meanwhile swirl above the scene, drawn in by what (within the terms of this story, obviously) they already know is an event of cosmic significance. Everyone is experiencing this moment in a different way, so that it will explode outwards into the future in many different directions, but, in this instant, they are all in one room, and the same light falls on all of them. Venice is full of huge Tintorettos. There are lots of them in the Doge’s palace (including some incredibly detailed and energetic battle scenes, which I admired but was not particularly moved by). And the Scuola Grande di San Rocco has three whole floors of them. Most of these didn’t do much for me, I have to say, but they build up to a gigantic, twelve metre-wide Crucifixion in a side room on the top floor which rivals, and perhaps surpasses, the Last Supper for sheer energy. (Again: you need to make this image as big as you can to get any sense of it: it’s packed with detail.) As with the Supper, everyone is seeing different things and many are completely missing the famous drama going on immediately above their heads, but it is a single moment nevertheless, and the whole thing blasts out at you like an exploding bomb. Next Next post: When will we get there?